NYC’s Newest Fine-Dining Restaurant Costs $225 — Hold the WaitersBouley at Home opens this Thursday. 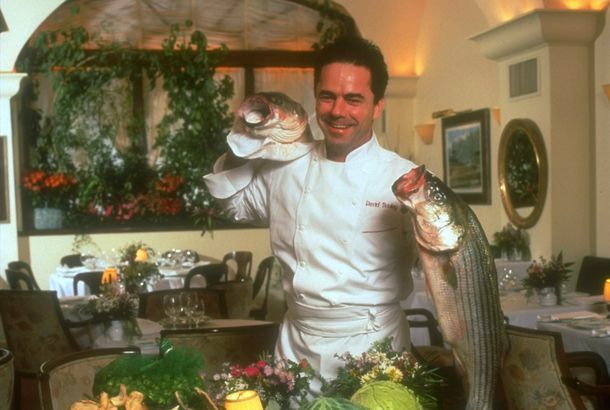 Bouley, One of New York’s Most Important Restaurants, Is ClosingOver three decades, David Bouley has worked relentlessly to advance his own distinct vision of fine dining. See David Bouley Make Dinner for Alice WatersBouley decided to honor Waters, and the 20th anniversary of her Edible Schoolyard Project, in a way they could mutually appreciate: by cooking a meal. David Bouley Cooking Charlie Trotter Tribute Dinner Tomorrow at Beard HouseThe pair famously cooked a multicourse dinner there 21 years ago. Lunch at Jeepney; New York Toasts Beer WeekPlus: David Bouley offers cooking classes, and more, in today’s Leftovers. Here’s How New York Chefs Beat the FluMurder your sniffles. Now Bouley Is in a Sue-Vide SituationAnother day, another drama. David Bouley Needs a VacationAnd he knows exactly where he wants it. What to Eat at David Bouley’s Brushstroke, Opening to the Public TonightA look at the à la carte food menu and the list of drinks. Tribeca Gains Brushstroke, Loses Il MattoMore on David Bouley’s ambitious new venture. Bouley’s Brushstroke Opens April 20A look inside the long-anticipated project. No Crowds Storming NobuBecause of the snow, sales are off 50 percent. Bistrong Leaves Braeburn for BouleyThe West Village loses a solid neighborhood spot. Dispatches From the Bocuse d’Or: Day OneGillian Duffy chats with Team USA at the culinary competition in Lyon. David Bouley’s Boji Now Slated for Mid-MarchBut we’ll believe it when we see it. David Bouley Explains the Finer Points of Comté FoamPlus stories of his secret teenage life as a whipped-cream fighter! Bouley Offers a Glimpse of Long-Awaited Kaiseki RestaurantBut it won’t open until next year. Bouley Closes Upstairs — UpdatedThe chef closed Bouley Bakery and Market in April. Shea Gallante Is Waiting Things Out in Port ChesterThe former Cru star is opening a new restaurant. But it won’t be in Manhattan. Bouley Closes Bouley Market, Changes BrushStroke PlansDavid Bouley will be spending more time in the kitchen of his flagship restaurant. Shea Gallante Splits With BouleyThe former Cru chef is back on the market. Alton Brown, Lidia Bastianich, and Wolfgang Puck Will Host Beard AwardsAnd a cavalcade of Outstanding Chefs will present. Celebrity Chef Cribs: Boulud Selling Condo? Bouley Facing Foreclosure?David Bouley is said to be facing foreclosure. Bouley: BrushStroke Will Open in Early JulyWhat will be on the menu at David Bouley’s new Kaiseki restaurant? Contaminated and Expired Ingredients at Bouley, Mouse Droppings at MarketThe result of the venue’s latest health inspections. David Bouley Will Sell Wine at $5 Per OuncePart of Bouley Bakery will be turned into a wine bar. Landlord Sues Bouley for $1.3 MillionThe esteemed chef allegedly hasn’t paid rent for two years. A Big Birthday for Guinness; Tavern on the Green Won’t Be Done for a WhilePlus: Legal troubles for David Bouley, and a Trader Joe’s for Chelsea, all in our morning news roundup. Champions Round BeginsA recap of last night’s episode. Shea Gallante Out at Cru; Philip Guardione In at the New Merkato 55Merkato has a new name and one of the city’s top chefs has a new home. Bouley Bakery Reopens As Bouley MarketTribeca gets another gourmet grocer. Dollar Pizza on the Rise; Murray’s Cheese Goes MidwesternPlus: David Bouley ruffles feathers in Tribeca, and where to drink on Thanksgiving, all in our morning news roundup. Neighbors Nervous About Meatpacking Noise; Bouley Gets Thumbs-up from CB2Also in our CB2 roundup: a liquor license for Alexandra and outdoor drinking at Soho Park, but no bar above Five Guys on Bleecker. Secession IndeedSecession’s opening night almost saw a celebrity walkout. Casella’s Salumeria Rossi Slightly OpenThe chef’s Upper West Side prosciutto heaven opens for press previews, and soon, the hungry masses. Cooking Dashi and Miso With David BouleyDuring this weekend’s New York Culinary Experience, students were treated to intimate cooking lessons from the masters. We were there for the ride.